June is here, and this means summertime, vacations and backyard barbecues! School’s out and it’s time to get into the pool, and to hang outside and listen to a baseball game on the radio. In addition to the boys of summer, Sports in the month of June include the Stanley Cup Championship, the NBA Finals, The US Open Golf Tournament, Wimbledon, and the College World Series. We got you covered with TV listings, Links from around the web, and FULL Schedules for each. If you are into racing, June has it all with the 24 Hours of Le Mans, The third leg of the Triple Crown at Belmont, and of course NASCAR. June is also home to Father’s Day, so plan your cookout today. Don’t forget to hang your American Flag on the 14th, and eat a donut on the 7th. If you are in the Milwaukee area, you have to try a pickle on a stick and cheese curds at Summerfest. If all that wasn’t enough for you the FIFA World Cup championship starts this month. It’s also hard to imagine that the longest day of the year is right around the corner, so read on to see what’s happening in the world of sports this month. 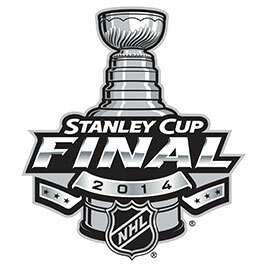 NBC is proud to present the 2014 Stanley Cup Final. Games will be broadcast on NBC, and NBCSN, Additionally, every game can be viewed live on your desktop and mobile device via NBC Sports Live Extra and the NBC Sports Live Extra app. After the San Antonio Spurs’ thrilling 112-107 overtime win over the Oklahoma City Thunder on Saturday night, the NBA Finals rematch is set. The Spurs will again tangle with LeBron James and the Miami Heat for the championship. We can only hope this year’s meeting is as exciting as last year’s. Miami captured back-to-back titles after falling behind three games to two in the series. A miracle comeback in Game 6 helped propel the Heat to a second title. This year, the slate is wiped clean, and the battle is on again. As we head into summer and the calendar flips to June, we can start to think about some teams being eliminated from contention, and we have a much better idea of who is the cream of the crop. I can’t believe I am writing this, but the team from Oakland sits atop the FANFOOD TOP 10. Sonny Gray has been impressive, although his last start was not something to be proud of. Gray entered the evening a perfect 10-for-10 in quality starts, but he didn’t have his best stuff against a stellar offense last time around. The 24-year-old came into the game with a 1.99 ERA, which then spiked to 2.31. Everybody deserves a night off once in a while. Of course The A’s are much more than one young arm. As they say, you can’t predict baseball. After Detroit won six straight in Baltimore and Boston, the Tigers got swept by the struggling Indians and lost three of four at home to the depleted Rangers in a series that saw backup infielder Danny Worth pitch not once, but twice. The reason for the struggles comes down to the starting pitching, which posted an ERA over 8.00 in that 1-6 span, Despite this they are still the second best team in the bigs. San Francisco was the last team in the FANFOOD Top 10 in May, and since then the Giants just kept on rolling. They swept the Twins and outscored them 16-4 in three games this past weekend. At one point they went 15-7 in May and boast the best record in baseball, they round out the FANFOOD Top 10 heading into June. The 2014 U.S. Open Golf Championship will be played from June 12 – 15 at the Pinehurst Resort in Pinehurst, NC for the third time in its storied history. Pinehurst will also host the 2014 Women’s US Open this year beginning on June 19th, marking the first time that both championships will be played in the same year on the same course. Rising from humble beginnings, the first US Open was a nine-hole course, one-day tournament played on October 4, 1895 in Newport, Rhode Island. The winner? British player Horace Rawlins who received a whopping $150 in prize money and a gold medal. Over the decades, the US Open has emerged to become one of the four majors offering prize money topping $1 million for the winner who also enjoys a much more secure spot in the profession including an automatic invitation to play in the Masters, the British Open and the PGA Championship. While the US Open has been dominated by American players over the years, the tournament has seen a notable spate of non-American winners between 2004-2007 including South African Retief Goosen (2004), New Zealander Michael Campbell (2005), Australian Geoff Ogilvy (2006) and Argentine Ángel Cabrera (2007). In 2010, Graeme McDowell became the first Irishman to win the event and the first European to take the title since British player Tony Jacklin won in 1970. Another Irishman — 22-year-old Rory McIlroy — walked away with the championship at 268 to break the U.S. Open record by four shots in 2011. And, just to add to the drama — it was a relative unknown, American pro Webb Simpson who won one stroke to take his first major championship victory in 2012. In 2013, Justin Rose won his first major title, two strokes ahead of runners-up Jason Day and Phil Mickelson, to became the first player from England to win the U.S. Open since Tony Jacklin in 1970. The U.S. Open is staged at a variety of courses, set up in such a way that scoring is very difficult with a premium placed on accurate driving. U.S. Open play is characterized by tight scoring at or around par by the leaders, with the winner usually emerging at around even par. A U.S. Open course is seldom beaten severely, and there have been many over-par wins (in part because par is usually set at 70, except for the very longest courses). Normally, an Open course is quite long and will have a high cut of primary rough (termed “Open rough” by the American press and fans), undulating greens (such as at Pinehurst No. 2 in 2005, which was described by Johnny Miller of NBC as “like trying to hit a ball on top of a VW Beetle”), and pinched fairways (especially on what are expected to be less difficult holes). Some courses that are attempting to get into the rotation for the U.S. Open will undergo renovations to develop these features. Rees Jones is the most notable of the “Open Doctors” who take on these projects; his father Robert Trent Jones had filled that role earlier. As with any professional golf tournament, the available space surrounding the course (for spectators, among other considerations) and local infrastructure also factor into deciding which courses will host the event. In the US, watch for four full days of TV coverage airing on ESPN and NBC Sports beginning on June 12 leading up to a Father’s Day final on Sunday, June 15, 2014. USGA Championship – U.S. Open – As the championship draws near, catch the latest news & feature stories, TV schedule, and background & history of the course. BBC Sports – Golf – Featuring live U.S. Open updates, breaking news and analysis, leaderboard, feature stories, video and audio reports, picture galleries. Golf.com – The digital version of the print magazine with major U.S. Open coverage & interviews, plus putt around the rest of the site for lots of special features including golf videos, online lessons, fun and games. U.S. Golf Open Championship – Great background information from Wikipedia with a preview, past winners and related references and resources. This year, all eyes are on California Chrome, who is poised to become the first Triple Crown winner in 36 years after winning both the 2014 Kentucky Derby and Preakness Stakes! The official Belmont post positions, odds, and selected jockeys will be announced live from Belmont Park on Wednesday, June 4, 2014 as race day draws near. The milestone 146th running of the Belmont Stakes will be run on Saturday, June 7, 2014 with post time at 6:30 PM ET and complete TV coverage airing on NBC beginning at 5 PM ET. California Chrome and his team already passed their first test in their attempt to win the first Triple Crown since 1978 when it was announced the thoroughbred would be allowed to use a nasal strip in the June 7 race. But how exactly does an adhesive give an advantage to the horse? ESPN The Magazine’s Regina Nuzzo has the answer: It’s a way to avoid bleeding in the lungs, a common problem with racehorses. If you’re wondering what other horses don’t wear one if that’s the case, Nuzzo asked Jim Chiapetta, the co-inventor of the strips, that very question. He said there are multiple studies proving the benefits, but not enough people have read them to use the strips. The last and most demanding (1-1/2 mile) jewel in the Triple Crown, the Belmont race is also known as “The Test of the Champion” for the gruelling physical toll it takes on 3-year-old horses and the critical pacing and timing demanded of skilled jockeys. Hey…this is the Big Apple – and In the final showdown, only the smartest and strongest survive. The lineup of major contenders in this year’s Belmont stakes hang on the Kentucky Derby and the Preakness, and how well horses perform in those two races. This year, California Chrome is the star performer who also looks to win the Belmont to become the first Triple Crown winner since Affirmed took the title in 1978. If he wins, California Chrome wil be the “lucky” 13th horse to win the Triple Crown. His main competition? Besides familiar names like Ride on Curlin (in second place at the Preakness) and Commanding Curve (in second at the Kentucky Derby) other new contenders at Belmont include Tonalist and Commissioner, who were first and second at the Peter Pan Stakes at Belmont, the traditional prep for the Belmont Stakes. And, who can say if a dark horse will unseat this year’s champion? For years, major spoilers have occurrred at Belmont, where anything can happen and often does! Stay tuned…. NBC Sports – Horse Racing – The official home of the televised Triple Crown races featuring Belmont news and related articles, video clips, history and trivia, plus fun features on the Kentucky Derby and Preakness races. Belmont Stakes – Wikipedia – Deep background, historical facts & photos along with a complete list of winners and jockeys dating back to 1867. The Belmont Breeze – Party on – with a recipe for the official drink of the Belmont Stakes. The matches kick off on Monday, June 23 leading up to the women’s final on Saturday, July 5 and men’s final on Sunday, July 6, 2014. Wimbledon will be aired on ESPN and ESPN2. Wimbledon.com – Check out the official site with the latest headlines, video, feature stories, photos, plus ticket information & prices for ticket packages and accommodations, visitor and museum info, directions for getting there, along with Wimbledon history, records and stats. BBC SPORT | Tennis – The Beeb Online as only they can do it, with reports from center court at Wimbledon, player profiles, video clips, photo galleries and the television schedule for BBC 1 and BBC 2. ATPtennis.com - The official site for men’s professional tennis with video & audio reports from Wimbledon, scores, standings, feature stories & interactive head-to-head comparisons. WTATour.com – The official site of women’s professional tennis featuring Wimbledon player profiles, rankings, feature stories, a photo gallery plus a FanZone with an online shop, free wallpaper and related downloads. Guardian Unlimited Sport | Tennis – All the latest news and commentary from Wimbledon Stadium. Keep up to date with the most recent headlines on who’s in and who’s out. Wimbledon – Wikipedia – The free online encyclopedia with historical color commentary and info on men’s and women’s singles and doubles champions from 1913 to the present. Wimbledon Cup Recipe – Get happy with the traditional Pimm’s, gin, cream and mandarin juice cocktail to celebrate the day. And for you Yanks, translate ‘double cream’ to heavy cream. Poached Salmon with Cucumber-Dill Sauce – Another traditional recipe at Wimbledon, washed down by at least a bucket of strawberries and ice cream. At 24 Hours of Le Mans, automotive expertise and determination combine to provide a showcase for endurance, technological achievement, as well as plain, old-fashioned race car thrills. This year marks Le Mans’ 82nd anniversary, with all the action kicking off on Saturday, June 14 and continuing to Sunday, June 15, 2014 airing live for an expected TV audience of millions as the race is broadcast on 100 TV networks worldwide. SPEED TV will air the 24 Hours of Le Mans on demand at their Web site and on their network beginning Saturday morning. The winner of the 2013 Le Mans race? It was Audi Sport Team Joest, comprising Danish driver Tom Kristensen, British champ Allan McNish, and Frenchman Loïc Duval driving an Audi R18 e-tron quattro. Begun in 1923, the historic race is annually sponsored by Automobile Club de l’Ouest and takes place at the Circuit de la Sarthe near Le Mans, France. Today, qualifying races which take place on Europe’s most prestigious circuits help to determine which cars are selected for 24 Hours of Le Mans. Le Mans 24 Hours has proven to be a very popular export with the rise of the American Le Mans Series, and the Japan Le Mans Series, both which help sustain the ideals of endurance and technological achievement in their respective national equivalents. Le Mans 24 Hours – The official site including the latest news & updates, complete entry list, related history including a searchable database of results and times dating back to 1923 plus additional photos, video and multimedia presentations available with paid membership. 24 Hours of Le Mans – Wikipedia entry with a detailed history including pop culture references, facts & information on the famous 1955 Le Mans disaster, an overview of the circuit, a complete list of winners, pictures, related links. 24 Hours in Le Mans – Fan site with exceptional images as a result of a marathon photo shoot in 2005. Le Mans – The cult classic starring Steve McQueen that used actual footage of 24 Hours of Le Mans, including site fan forum, lots of interesting behind-the-scenes factoids, photo gallery & memorable movie quotes from the Internet Movie Database. The College World Series takes place each June at TD Ameritrade Park in Omaha, Nebraska, a championship perhaps more closely followed by college baseball fans than the major league World Series for which it is named. Leading up to the College World Series is the NCAA Division I Baseball Championship tournament in May, which features 64 college baseball teams battling it out in a series of elimination games. Winners of the regionals are given spots in the super regional games located throughout the country. Two teams go head-to-head at each location for a best of 3 game series, and the field of 64 teams competing for the 2014 NCAA Division I Baseball Championship has been announced. The national top eight seeds are Oregon State (42-12), Florida (40-21), Virginia (44-13), Indiana (42-13), Florida State (43-15), La.-Lafayette (53-7), TCU (42-15) and LSU (44-14-1). The top eight seed for Indiana marks a first for a Big Ten institution. The Southeastern Conference (SEC) led all conferences in the number of teams in the championship field with 10, the most for a single conference in the history of the tournament. The Atlantic Coast Conference (ACC) has seven institutions, while the Big 12 and Pac-12 Conference each have five selected. Making the tournament for the first time includes Kennesaw State of the Atlantic Sun Conference and Sacramento State of the Western Athletic Conference. Overall, 32 of the 64 teams were in the field last year. Miami (Fla.) is in the field for the 42nd consecutive year, extending its own record. Florida State is making its 37th consecutive appearance, second all-time. Other long consecutive streaks: Cal State Fullerton (23), Rice (20) and South Carolina (15). Each of the 16 regionals features four teams, playing a double-elimination format. The regionals are scheduled to be conducted from May 30 to June 2 (if necessary). Selection of the eight super regional hosts will be announced on ncaa.com on June 2 at approximately 11 p.m. ET. The 68th Men’s College World Series begins play June 14, at the TD Ameritrade Park Omaha in Omaha, Nebraska. NCAA College World Series – Official site featuring event schedules, ticket information, the latest scores, history, pictures & feature stories, plus local metro shuttle info to the ballpark. College Baseball on Yahoo! – Up-to-the-minute coverage including streaming video broadcasts, picture gallery, complete TV schedule, scores & standings, feature stories. College Baseball – Rosenblatt Report – Keep up with all the action at the College World Series with daily blogs from Kendall Rogers including additional feature stories, news & analysis, photos. Baseball America.com – College – World series, regional and super regional coverage including feature stories on who to watch, daily college baseball blog, weekly chats, coach tracker, searchable player finder, and downloadable College World Series Preview in pdf format. College World Series – A complete overview with details on its history, lists of winners & related links, from Wikipedia. The PGA Tour is the organizer of the main professional golf tours played primarily by men in the United States and North America. It organizes most of the events on the flagship annual series of tournaments also known as the PGA Tour, as well as the Champions Tour (for golfers age 50 and older) and the Web.com Tour (for professional players who have not yet qualified to play in the PGA Tour), as well as the PGA Tour Canada and PGA Tour Latinoamérica. Originally established by the Professional Golfers’ Association of America, it was spun off in December 1968 into a separate organization for tour players, as opposed to club professionals, the focal members of today’s PGA of America. Originally the “Tournament Players Division,” it adopted the name “PGA Tour” in 1975 and runs most of the week-to-week professional golf events on the tournament known as the PGA Tour, including The Players Championship, hosted at the TPC at Sawgrass, the FedEx Cup, and the biennial Presidents Cup. The remaining events on the PGA Tour are run by different organizations, as are the U.S.-based LPGA Tour for women and the other men’s and women’s professional tours around the world. The United States Tennis Association (USTA) is the national governing body for the sport of tennis and the recognized leader in promoting and developing the sport’s growth on every level in the United States, from local communities to the crown jewel of the professional game, the US Open. Established in 1881, the USTA is a progressive and diverse not-for-profit organization whose volunteers, professional staff and financial resources support the singular mission. The USTA is the largest tennis organization in the world, with 17 geographical sections, more than 770,000 individual members and 8,000 organizational members, thousands of volunteers and a professional staff dedicated to growing the game. With the USA’s recent emergence on the worldwide soccer stage, look for an extra bump in worldwide audience attention as the FIFA World Cup championship gets underway in 2014! The milestone 20th edition of the World Cup games is set to begin on June 12, 2014 in São Paulo, ultimately leading up to an exciting final in Rio de Janeiro at Maracana Stadium on July 13, 2014. Brazil, as official host country, was granted an automatic berth in the 2014 World Cup. They will play Croatia at the opening game on June 12. Totaling 32 teams in 8 groups, major contenders for a 2014 World Cup berth also include Spain, France, England, Russia, USA, Germany, Portugal, Netherlands, and Belgium. The complete lineup was decided with the completion of the final qualifying games played on October 11th and October 15th. Weeks later, the 2014 World Cup final draw was announced live from Brazil on Friday, December 6, 2013. In the USA, 2014 World Cup will be televised in its entirety on ABC, ESPN, and ESPN2. Every first Friday in June, donut lovers all rise to celebrate a wonderful circle of sweet, doughy goodness that has a day set aside ‘holey’ in its honor. This year, mark your calendars for Friday, June 6, when Americans everywhere kick back and enjoy a frosty one on National Donut Day 2014.
Who gets the first donut? Some historians can trace the donut back to a fried treat served by New Yorkers during 18th century Dutch colonial days. America’s favorite? Today, Entenmann’s remains the largest donut-maker in the United States, producing more than 40 million boxes a year. The company’s rich frosted chocolate donut has been the #1 best seller since its introduction in 1972. As usual, watch for national donut chains like Dunkin’ Donuts and Krispy Kreme occupying battle stations on National Donut Day, with competitive offers and free donuts to lure in customers in a celebratory mood. That said, National Donut Day can be celebrated in any way you choose. As long as it’s glazed, powdered, chocolate or plain! Colored sprinkles are extra festive on this hole-iest of holidays, or try mixing it up with morale-boosting Bavarian or Boston Creme. 1. Heat oil in deep fryer to 375 degrees F.
2. In a large bowl, mix together flour, sugar, salt, baking powder, cinnamon and nutmeg. 3. Mix in melted butter until dry ingredients become crumbly. 4. Stir in milk and beaten egg. 5. Flour your hands and begin to knead the dough until firm and smooth. 6. Turn dough out onto a floured board and flatten down to 3/8 inch thickness. 7. Dust donut cutter with flour and press into the dough. 8. Slowly and carefully drop donuts into the hot oil and fry for about 1 minute on each side or until golden brown. 9. Drain on paper towels. Helpful hint: For a quick topping, add granulated or powdered sugar to a brown paper bag. Add the donuts, close the top, and give the bag a good shake until donuts are coated.